Have you ever wonder what the modern science can do for you? Of course, that curing cancer is a great thing to achieve, but why not including science into your daily routine? First time I heard about air fryers, it seemed like a typical scam. Before splashing the cash, I wanted to make a bit of research myself. I’m keen on watching great chefs, and there was no other who could be a stronger voice for pros and cons of this appliance. This is what those famous people had to say. 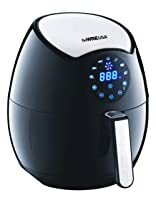 My all-time favorite yelling and cursing chef had used the Airfryer, and according to him, it was a quite pleasing experience. He is known for using the as healthy recipe as possible, and this was my primary concern. He had some negative comments about the fact that nothing can replace the taste of deep fried fast food, but he also stated that to paraphrase, Airfryer uses only a tablespoon of oil, and the taste is surprisingly excellent. This was the fact which pushed me closer to buying one, but I still needed some persuading. Gordon was very pleased with the looks of the food, and we know how much is that important to him (remember this video?). When he praises the texture and the taste, then that is all that I need to hear. Also, it was noted that Airfryer is fast, and leaves much less mess behind. Perhaps not famous as the previous chef, Meredith had become known for her laid-back approach to cooking. That is why she got the nickname The Blue Jean Chef. According to her, “Cooking should be fun, relaxing, comfortable – just like your favorite jeans.”. I love this approach to food, because I’m not a professional, and I like to enjoy the process. All that was needed was a list of recipes I could try to prepare. In the meantime, I have bought the air fryer. As far as I’m concerned, any recipe which includes deep frying is great for beginning. Frozen food is quite tricky to prepare, and to be honest, and this is where air fryer shines. The food such as French Fries and frozen chicken wings is incredibly easy to make. 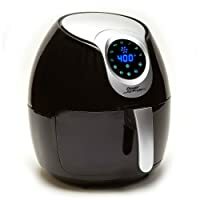 Put the food in the air fryer, spray some oil over it, and cook for about 7-8 minutes at 200 degrees Celsius. As for the vegetables, I have noticed that cauliflower, for example, is not quite good. It is no wonder because green vegetables are meant to be steamed, rather than fried. Recipes such as Shrimp Egg Rolls and Beer Battered Onion Rings are a bit more complicated, but nothing that cannot be made. Our next chef comes from the United States and is famous for her “slow cooking” method she often uses. Her advice on preparing chicken in this fryer came from her book on air frying, and it was met with some skepticism. Chicken breasts are known to be somewhat dry especially when fried, but oh my, was I wrong to doubt! Paula recommended to just put the chicken meat in the fryer, spray oil over it, and that is it. I have to agree with her that meat prepared this way is much better, softer and the taste is amazing. Although she admitted thinking that “There ain’t no way that this thing can fry chicken. No way.”, it was very nice in the end. And, as a bit of advice, leave it overnight in a marinade of oil and rosemary. It will provide an excellent taste. Another United States based chef, Linda already has an excellent writing history with thirty-seven cookbooks, and she plans to keep writing. Therefore, her air fryer recipe cookbook was something that caught my eye. Her approach was very appealing to me because she tends to make a “whole list” cookbooks. In other words, she will give you pieces of advice on how to prepare an entire meal from the soup, main course and of course, the desert. It was her recipe for Apple Peach Cranberry Crisp that I made. Needless to say, I was amazed at how everything is comfortable with a different approach! Among younger chefs, Becky drew my attention with her choice of meals. She is a vegan, and although I’m not, I have a lot of friends who are vegan or vegetarian. This is the reason why I have taken her opinion into consideration, and because she is also a blogger, and I love to hear the opinion from someone who is up for trends. She admitted that first motivation to buy a fryer is of curiosity. It was similar to me, and this made me feel that she may give an opinion from the same standpoint as mine. And she did; along with saying that cooking this way is much healthier, easier and faster. She also praised the easiness of cleaning, something which will take approximately the whole afternoon for a deep fryer. However, she said that it is a bit expensive. I tend to agree, and while I have found GoWISE USA GW22643 she is using, I have opted for Philips’s one, simply because of the name. Nevertheless, she gave me an excellent idea about what to buy to my friend for his next birthday. Another blogger on my list, Jennifer comes from the Land Down Under and considers herself as a person who is an avid lover of fried food. According to her, all of this would be okay without the possibility of cholesterol or gain extra weight. Because of her love for this type of food, she was perfect to include to my list. What intrigued me the most on her list, is the recipe for duck pies. I haven’t prepared those before, but they turned out very well. All you need is to take a roasted duck, chop it, add up green onion, plum and hoisin sauce, wrap it up in gow gee wrappers and air fry it for about ten minutes. The taste was pretty impressive because I’ve never tried plum sauce before. To be completely honest, Kelly’s review of Philips’s air fryer was one of the reasons why I have opted for this brand. She gives an excellent point by saying that probably the most notable advantage of this appliance is its small size; somewhat smaller than a rice cooker. I don’t have trouble with space in my kitchen, but I’m always looking into improving things where it is possible. Small dimensions are excellent! Also, her recommended recipe was that for Fried Adobo Chicken Wings which I have considered as the pinnacle of my kitchen skills. Although it seems a bit hard, just follow the instructions as I have, and you will be all good. Considering how much fuss and noise the air fryer has made on the web, I was stoked to see that it’s not a fluke. I mean, if Gordon Ramsay says something is good and that you should use it, then you really should consider that! On the other hand, all the cooking experts mentioned in today’s list have a list of recipes and tips for using this magnificent device, thus meaning they surely use it for a while now (since they managed to create all those amazing recipes). The word of praise about air fryers spreads across the internet like a wild fire. And, for many good reasons. You should definitely consider getting one, if not for my recommendation, but for the recommendation of names such as Gordon, Meredith, Paula, Linda, Becky, Jennifer, and Kelly. The Black+Decker HF110SBD reigned supreme as we placed it alongside other top-performing air fryers and have them undergo rigorous performance tests. From the looks to the power, Black+Decker produced consistent high food quality, most user-friendly across ages, high wear-and-tear quality, and the easiest to clean up (including its accessories). Among the countless air fryers out today, we still cannot find our “the one”. And with so many factors involving the purchase, it’s just too hard to make the final decision. For a very even competition, we chose the air fryers with almost the same sizes (cooking capacity and floor space), cooking features or programs, main settings (timer and temperature), and appearance. 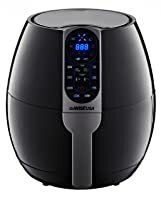 Narrowing down our list to the top five outstanding air fryers in the market: Black+Decker HF110SBD, GoWISE GW22621, Philips HD9220, Avalon Bay AirFryer, and Le Coucou HarmonyI-W. The clean up test involved what things needed to clean the machine and its accessories, and could it be cleaned with just the dishwasher.Though we did not include price as a basis, we looked for that “value for the buck” quality based on peer assessments. Though we did not include price as a basis, we looked for that “value for the buck” quality based on peer assessments. We tested and reviewed the Black+Decker HF110SBD Two-Liter model. This is an ideal size to do batches of cooking test and is just enough for serving two people. We strictly followed the cooking instructions for each recipe we have prepared for Black+Decker. Surprisingly, they all came out as exactly as they are described in the recipe. The jalapeno poppers came out with crispy skin and the cheese inside oozed gooey goodness. The air fried catfish was flaky to the touch and juicy to the taste. The air fried chicken and French fries were golden brown and crispy. The inner cooking surface of this countertop necessity has a non-stick coating, so all it needs is a quick wiping after use. The non-stick ability also makes the food smoothly slides off for easier transfer. Of course, we’ve checked the dishwasher capability of Black+Decker and it passed. Overall, no sweat with cleaning the inside and outside of the air fryer. The Black+Decker leans towards to a less modern features which we approve. The turning dials and knobs make the machine less intimidating to both young and old users. The numbers are also clearly seen, which again makes it easier to be manipulated and monitored. Though we think it can be facelifted with cooking programs for an even easier use. The safety features makes it worry-free to be used by all the consumers. This consistent high food quality can be a result of 1200-watt power draw which is slightly lower than competitors. This also makes the Black+Decker an excellent power saver appliance.Black+Decker has been a household name for long-lasting, durable of all sorts of known appliances and the HF110SBD is no different. It has a two-year warranty that secures your worries of wearing it down. Black+Decker has been a household name for long-lasting, durable of all sorts of known appliances and the HF110SBD is no different. It has a two-year warranty that secures your worries of wearing it down. The turnable knobs and dials are quality tested to withstand the roughest of hands and ensure long-lasting use. And since there isn’t much technology to update, it’s going to be on your countertops longer than you expected. 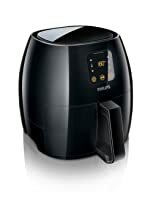 The sturdy built extends with the air fry basket and tray that just smoothly slide in and out of the air fryer. It even has an automatic shut off and cool-to-touch handle as some of its safety features included. What you would also appreciate about this brand is the fact it’s available almost anywhere and everywhere (online and offline). Plus the silver-black design fits any and every kind of kitchen styles. Black+Decker’s perfection is a tad bit delayed as we found rooms for improvement. Starting from the temperature knobs of 70 degrees increment. You have to do a guessing game for your cooking temp adjustments. Keeping an eye might be an additional job but it will save your dish from overcooking. Starting from the temperature knobs of 70 degrees increment. You have to do a guessing game for your cooking temp adjustments. Keeping an eye might be an additional job but it will save your dish from overcooking. The sturdy built of HF110SBD comes with a tape that secures the fryer bin to the inside but it lets out a residue during cooking. No fret; it can be easily removed with some scrubbing. There’s a recipe book included but online recipe versions are more detailed and clearly presented than the written version. 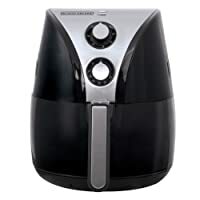 And lastly, Black+Decker should find inspiration from Philips’ wide array of air fryer accessories to be developed in the future. This is one of the reasons we weren’t able to do the frittata and souffle cook tests. It has endured all the tests we did and proven that it’s rooms for improvement does not make it any less excellent. 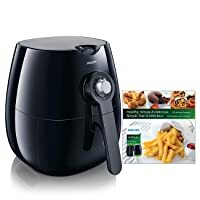 So, if you’re going for your first air fryer, Black+Decker won’t disappoint you in food quality, energy efficiency, and best value for your money.